AHMEDABAD: This time last year, the Ahmedabad Municipal Corporation (AMC) promised the Gujarat high court in an affidavit that would reform its road engineering department and curb corruption. 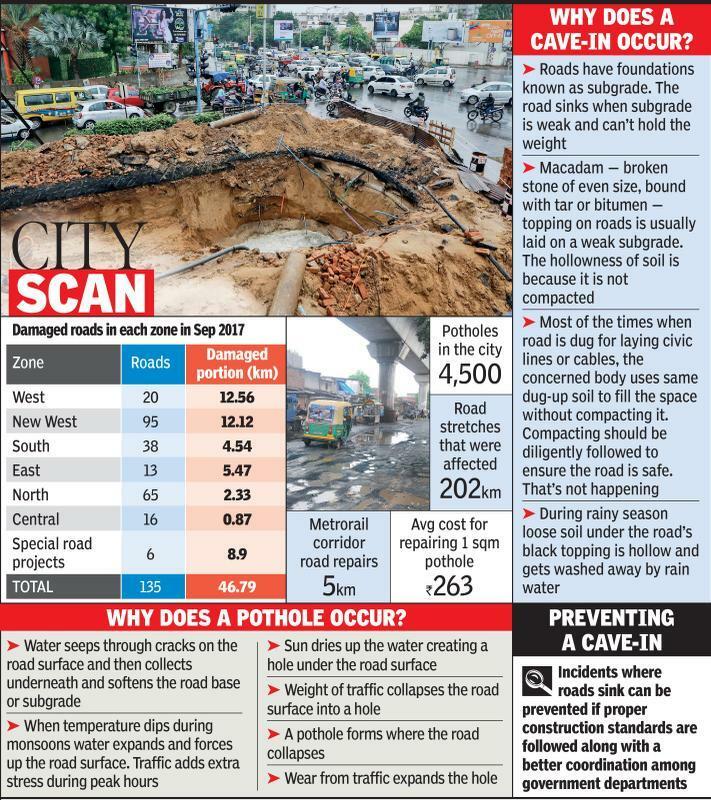 Now it seems — after 28 cave-ins in the 23 days and with nine road stretches that were repaired last year worn away — that despite the civic body’s assurances that it had used anti-stripping agents, Amdavadis should brace for cratered roads this month. Ordering enquiries when a road-sinks or a cave-in occurs is not a solution. Coordination between utility providers who repeatedly dig up roads can save crores of taxpayers money that is spent on repairing cave-ins. The AMC should demand a maintenance schedule from utility services and any deviation from the schedule or the standard of road repair should be penalised. AMC should stress on CRRI regulations so proper standards of road building are implemented. The deputy municipal commissioner (roads), in the affidavit, stated how the AMC planned to arrest corruption by fixing the defective liability period at three years and setting the performance guarantee at 10%, which would be forfeit if the road was damaged within the defect liability period. The affidavit cleverly does not say how many final bills were cleared for contracts. Between the end of July and early September 2017, AMC cleared Rs 111 crore of road repair contracts. The most damaged roads were in the West Zone and New West Zones, where 115 stretches had been damaged. The affidavit emphasized that new roads were laid with “bitumen tank nanotechnology-based reactive penetrative of 100% organosilane”, an anti-stripping agent. The affidavit said that AMC was making contractors sign an undertaking that they would be blacklisted permanently if they failed to provide quality roads.